Built for office use, the Samsung ML-6510ND is a dedicated mono laser printer that offers even faster print speeds. It is basic and straightforward, offering good upgrade and customisable options to suit the needs of specific workgroups. The Samsung ML-6510ND mono laser printer even offers networking and duplex printing as standard, ideal for shared printer environments as well as for offices who want to save on running costs. One limitation that this model has is its inability to print in colour, but otherwise, the ML-6510ND is a sound solution to office printing needs. The Samsung ML-6510ND laser printer has a compact frame, even with the additional components like the extra paper trays and automatic duplexer. Under the hood are 256 MB of RAM and a speedy 700 MHz processor. The machine can use a large capacity toner which does up to 40,000 prints. Ideal for almost any kind of office setting, the Samsung ML-6510ND is compatible with many computer platforms including Mac, Windows, Linux, and even Solaris, along with many other business platforms. Its paper input capacity is up to 500 sheets, using the standard configuration. Speed is the main highlight of the Samsung ML-6510ND fast monochrome printer. It prints at a hard to beat rate of 62 ppm, while keeping running costs low. 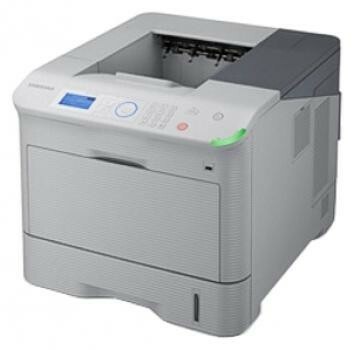 The Samsung ML6510ND network laser printer with duplex doesn't have the extra bulk that other laser printers have, and it can withstand heavy print loads. The ML 6510ND printer is also flexible, thanks to its upgrade options. However, the Samsung ML-6510ND laser printer still lacks colour printing capabilities, which means users will have to find a separate machine to do their colour printing tasks.